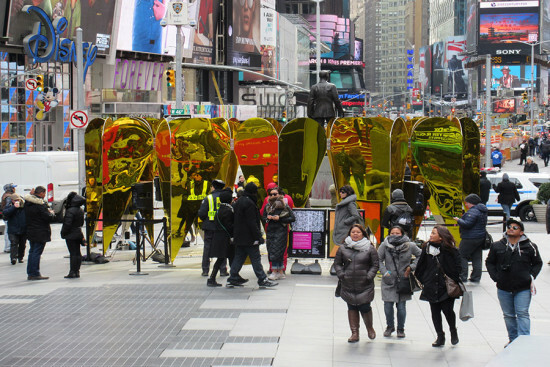 Every winter, the Times Square Alliance and the Center for Architecture choose a team of architects to design an installation for Times Square that a) has to both dialogue and compete with the pageantry of Times Square and b) is heart-themed for Valentine's Day. AN visited this year's Times Square Valentine Heart Design competition winner, Collective-LOK's Heart of Hearts, during its final week to speak with the architects and an artist/composer duo who created an interactive sound and visual piece within the installation. Formally, Heart of Hearts is a circle of aluminum–paneled hearts planted in the center of Father Duffy Square, a public plaza between 45th and 47th streets at Seventh Avenue and Broadway. Joshue Ott and Kenneth Kirschner, Times Square Alliance artists-in-residence, installed variant:breaker, a one-day interactive audiovisual installation that used four LED arrays and speakers that plays on Heart of Hearts' reflectivity to create an outdoor theater of sound and light. The partnership came about when Ott and Kirschner met Collective–LOK at a party, and, like Heart of Hearts, variant:breaker had to both survive and outperform the chaos of Times Square. The installation, Kirschner explained, was inspired by his young son's enthusiasm for his drum machine. Users created a sequence of randomly generated sounds by manipulating an iPad in the middle of the installation to activate the LED panels. The video below shows how the installation performed in action: https://www.flickr.com/photos/136339520@N03/25298776750/in/dateposted-public/ Conceptually, the objective of Heart of Hearts was to "out Times Square Times Square," explained Michael Kubo, one of three members of Collective–LOK. The trio wanted to take the hilarious spectacle that is Times Square and reflect it back onto itself, while creating inviting spaces for the more intimate spectacle of the kiss-and-selfie. The architectural renderings that accompanied the rollout of the project depicted a wedding, the Naked Cowboy, the famous llama, and the other happenings that give Times Square its weirdness. It turns out that the renderings were predictive: on Valentine's Day, despite the chill, multiple weddings were staged in Heart of Hearts. The architects were keenly attuned to the project's second life online, positioning their installation as the critical interface between the inherent narcissism of the selfie and an acute awareness of one's surroundings. The results would make Guy Debord proud. "The reflection was used to both embrace the context and have the thing and the space defined strictly by the context, but also, making people even more aware of the 'selfie moment' that we knew happened anyway," fellow collective member Jon Lott explained. "We were thinking about selfies from the beginning of the project," Kubo noted. "We asked, 'How do you build something that's an apparatus for people to take pictures of themselves but then decontextualize themselves, or make the things around them seem different?'" To find out, this normally selfie-averse reporter cozied up to a heart for a snap: In reviewing the photos, it was uncanny to see the the fragments and reflections (those pink fists!) that accompanied my image. The image could hardly be called a selfie, as Times Square inserted itself as a subject from all angles. Although the installation commands attention in the physical and virtual worlds, it had to make a minimal impact on the plaza. Drilling into the ground was verboten, so Collective–LOK designed an installation that was self-supporting. To give the installation its necessary rigidity and weight, the segmented hearts, which weigh a few hundred pounds apiece, were made from a quarter-inch-thick aluminum core sandwiched between eighth-inch gold acrylic mirror panels. Working with Brooklyn–based Kammetal, Collective–LOK had around one month to fabricate the piece and, due to the 24/7 activity in the square, an overnight installation timeframe a day before the unveiling. Although the collective would like to do more work in the public realm, there are no plans right now for Heart of Hearts to be installed elsewhere. When asked to name another space that would suit the installation, Kubo credited the essence of the installation to its context: "The particularities of the Times Square context are just unrepeatable." To commemorate its 120th anniversary, the Van Alen Institute is opening a new street-level space in New York City next Tuesday. The space, designed by Collective–LOK and located at 30 West 22nd Street, functions as a programming hub, event space, and gallery. Collective–LOK is a collaboration between Jon Lott (PARA-Project), William O’Brien Jr. (WOJR), and Michael Kubo (over,under). The team's proposal, called "Screen Play," won the Institute's 2013 Ground/Work competition, which received over 120 design submissions. 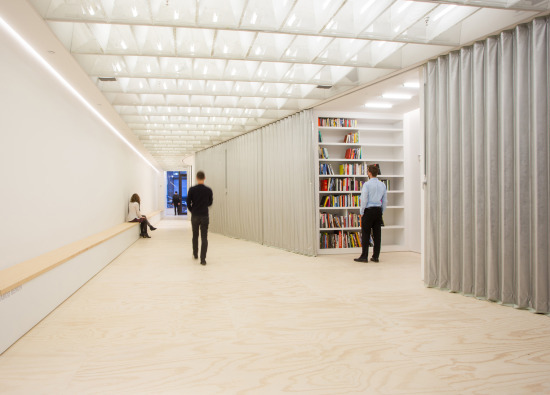 "Titled Screen Play...is a highly flexible space utilizing a subtle interplay of surfaces and screens to allow for the diverse range of uses demanded by the activities of the Institute, from multimedia exhibitions and lectures to workshops and private meetings," Van Alen said in a statement. "Each changing function of the bowtie-shaped floor plan will be partitioned by silver accordion walls and a series of four semi-transparent curtains that descend from discreet tracks embedded within the perforated metal mesh ceiling." The opening of this street-facing space comes as the non-profit works to broaden its audience in New York City and build its online presence. The Institute has recently adopted a new visual identity designed by Bruce Mau Design and is set to launch a new website by Helios Design Labs and Laurel Schwulst. The new space kicks off with Elsewhere: Escape and the Urban Landscape, a multi-year initiative that will explore "escape in the urban environment." A public celebration for the opening will be held on December 12 at 10:00p.m.